Happy Sunday to all my Maggie friends. I decided to make my girlfriend a card as she just got engaged to a wonderful man. How cute. I just love the stamp. Oh such a great card for your friends engagement!! Great scene, decorations and sentiment. How sweet this is. Love the doo hickey with the flowers and the flowers in the tree. Their initials (I assume) carved in the tree is a very cool touch. This is so cute! I love all the little extras added! Very Very cute! What a beautifukl scene and the colors are beautiful!!!!! Simply adorable!!!! Very Pretty, I'm sure thet your friend will love it! Adorable, adorable, adorable. Your friend will cherish this card for ever! Lucky her to be the recipient! Lovely keepsake for your friend. I love the little scene you have created. OMG this is so cute.... I love it! What a cute card. I am sure the happy couple loved this one. 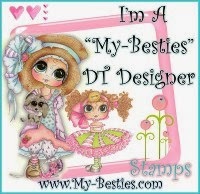 Utterly adorable, I love this image and your design. This is so sweet! Your girlfriend is going to love it. 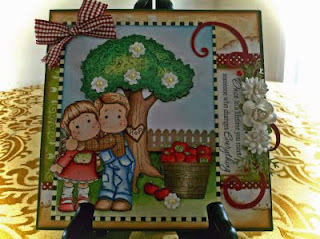 What a wonderful card, I love the beautiful scene you've created! I'm sure she will love it!